← Can I have some Little Plumcakes please? As you all may have guessed I am all over-the-top girliness when it comes to dressing my baby girl. After having two boys I just seriously love dressing her in ruffles, lace, and bows. Now she doesn’t always dress like this. She sports some super cute sleepers too; but you will never see her outside the house without a headband on her head! Scrolling through posts one day I saw a creation someone made using a FooFoo Threads pattern. I think I may have stopped and looked at it for a bit. I knew then that I just had to start testing for this designer, who had some awesome girly designs. Ruffles galore!!! I soon contacted the designer Jocelyn. I sent her my examples and waited to find if I had made the cut to join her testing team. Luck seemed to by on my side as she was looking for new people to add to the testing team in select sizes. I got to join the FooFoo Threads testing team!!! YAY!!! It wasn’t long until my first tester opportunity arrived. I loved it!!! And it was just perfect that this tester arrived just in time for baby girl’s 7month portraits!! Let me introduce you to the Cherry Strudel dress. Isn’t it simply divine in all its girly splendor? 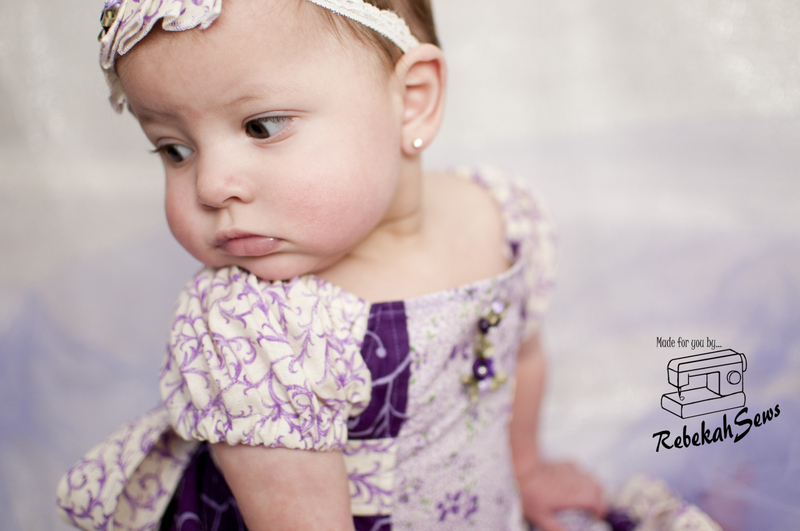 This little beauty is peasant style, and comes in 3-6mo – size 10, with a dress or tunic length. The front neckline offers two styles as well: squared or rounded. The body of the dress is made with six panels, two for each side, and one each for the front and back. As you can see it is a fitted dress. You are probably thinking “buttons or zipper?” Can I surprise you and say neither??? The back panel is elasticized. Best part though is it isn’t just shirring that is offered in the tutorial. For those of you that don’t find shirring their most favorite thing to do (like myself), she offers elastic casings for the back as well. Can you tell that is the option I chose? Now why just keep the elastic in the back? You can also make the front panel of this dress elasticized as well for even more comfort. Don’t forget about the ruffles! There are two rows of ruffles on both side panels and a ruffle on the hem too. Ruffles not your thing? Well leave them off! While you are at it, leave the ties off too if you wish. Even with the bare minimum this pattern leaves you with an amazing garmet that just shines with timeless elegance. Just after making this one dress I am hooked and want more FooFoo Threads patterns. There are soooo many I just love! You seriously have to check them out on Etsy. There is a sale going on now too! Buy 2 patterns and get 1 free, buy 3 patterns get 2 free, to the max of buy 5 patterns get 5 free! After you make one of these beauties you have to post on the Facebook group page so we can awe over your creation too!!! I think baby girl thinks its a winner!! She is adorable! I can’t wait to get my hands on this pattern, looks lovely and FFT never disappoints. She looks like such a doll, great job! Great job!! She looks so adorable!